Furious Netanya residents attempt to block terrorist's ambulance; details of attack revealed. 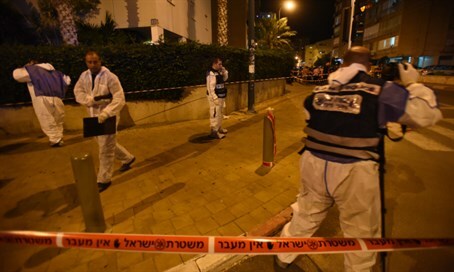 Further details about the Netanya attack have been released later Monday night, in the wake of the third stabbing of the day. Initial reports indicate that the stabber, a 22 year-old man from the northern Samaria town of Tulkarm, first attacked a couple, stabbing a 71 year-old man in the back; the victim was later transported to Laniado hospital in critical condition. Traffic police officers of the Sharon region called for the terrorist to stop, but he kept running, throwing his knife at a nearby building. Officers at the scene stated that, at one point, the terrorist turned around and pulled out another knife; security forces shot him three times, leaving him in serious condition. Shortly after the stabbing, another bystander attempted to attack the terrorist when he was already shot; police arrested the Netanya man at the scene. Not to be deterred, dozens of furious Netanya residents who had witnessed the attack attempted to prevent the terrorist of Monday night's stabbing attack in the city from being transported to hospital, footage reveals, blocking the road as the ambulance began to leave the scene.